During warm summer nights, the inviting orange glow of a fire under the stars makes the perfect place to unwind. You don’t have to go camping or even leave the comfort of your home to enjoy the peace and beauty of an outdoor campfire. At VistaPro Landscape & Design, we build and install outdoor fire pits, fireplaces and conduct other hardscaping services in Annapolis and Baltimore, MD to fit your home and give you a beautiful outdoor space you will enjoy for years to come. If you are looking for an outdoor area to use for parties and entertaining, an outdoor fire pit or fireplace makes a stunning focal point around your deck, patio or pool area. Made from stone, brick, stainless steel or other materials, your fire pit or fireplace will blend seamlessly with the rest of your outdoor setting, or you may consider redesigning the area around this centerpiece. We will help you design and build a fire pit that you and your family or your guests can circle around and enjoy together, or add a fireplace to your outdoor kitchen that complements the shape and design of the space. 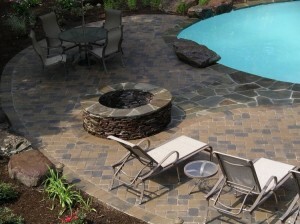 Take a look at our previous projects to see other hardscaping services, including outdoor fire pits and fireplaces completed in Annapolis, Baltimore and surrounding areas of Maryland. Contact us today to get started on your fire pit or outdoor fireplace today.